The Rimowa Topas collection is hand assembled in Germany, just like a BMW, so you know you are getting quality. They have used high-end materials, like aluminium, and it's zipperless, so you know it's going to be hard to break into (gotta watch those crafty thieves!). It is also specifically designed to meet all the requirements of Lufthansa airlines for both carry-on and checked luggage. So, this carry-on would be a great purchase for you, especially if you go on frequent but short trips. Should You Invest In The Rimowa Topas Suitcase? 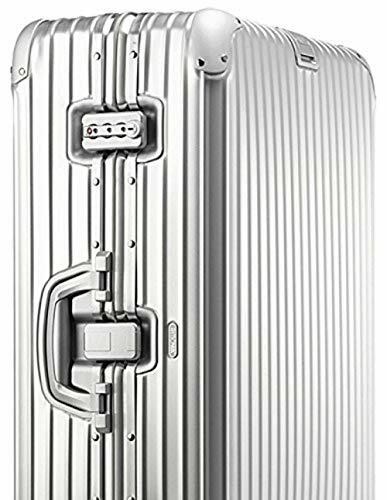 The Rimowa Topas is a zipperless, carry-on suitcase made of aluminum-magnesium. A good thing about this material is that it is really lightweight. And, you don’t even have to check it, which will save you some money on baggage fees. However, the light weight of the aluminum doesn’t make the suitcase too durable. In fact, it scratches and even dents incredibly easily. That is a huge con, in my opinion, especially when you consider its price. The corners of the suitcase are reinforced with aluminum, and they are covered with protective plastic caps. Unfortunately, the rest of the shell is exposed and vulnerable to marks. Just imagine checking your new shiny Topas for the first time, only to have it returned to you with scuffs and dents all over it. However, one might argue that those marks would give it character and make it special. After all, I still refuse the throw away my 10-year-old Samsonite suitcase that has taken such a beating that it is almost unusable. But, those marks remind me of all the trips we went on together; they’re like my own travel diary! 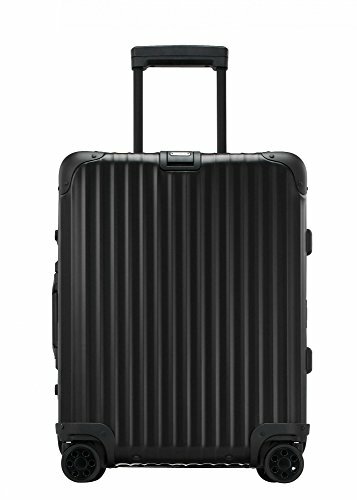 So, if you don’t mind that your suitcase will be all marked up, the Rimowa Topas still might be a good choice for you. And, after all, it is a carry-on piece of luggage, so you probably won’t even have to worry about baggage handlers being extra rough with your bag. The Topas features a rubber seal, which makes it waterproof. The contents of your suitcase will be safe from any moisture and dirt, no matter how long they are exposed to them. With this suitcase you will also get a 5-year warranty, which unfortunately does not cover transport damage. 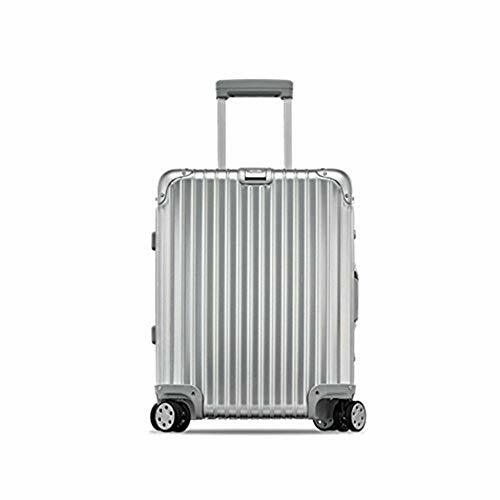 The double spinner wheels are one of the main selling points of this suitcase. With them, you will have superb maneuverability of your Topas, just as you would expect. Each wheel can turn 360 degrees, which allows you to steer your suitcase in any direction. 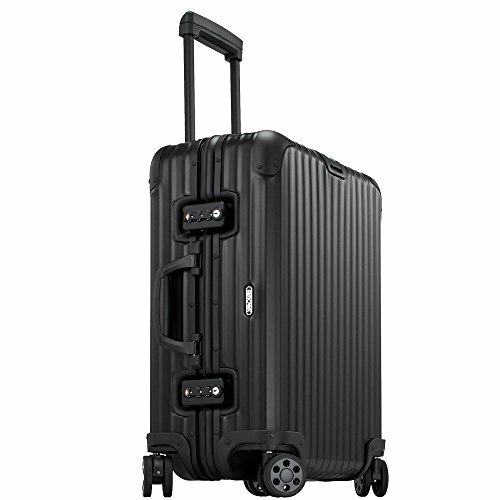 Rimowa also claims that the wheels are suitable for all types of terrain. Unfortunately, that does not appear to be true. The wheels actually damage quite easily, and are probably the first thing you are going to have to replace. Luckily Rimowa will do that for you, since the wheels are covered under their 5-year warranty. In order to prolong the life of the wheels on your Topas, avoid having them roll on uneven terrain. And definitely avoid rolling them off the curb – that might just be the end of them. The interior of the suitcase is lined with poly jacquard fabric. There are 2 compartments, which are both equipped with the flex-divider system. The dividers look really sturdy, and they guarantee that the contents of your suitcase will not budge an inch in transit. Well, unless you accidently packed your cat, but that is a completely different problem. Honestly, the inside of this suitcase just oozes luxury. The fact that both compartments can be secured with a divider is a huge plus for me, and they make the Topas look more elegant. You can open up the suitcase while it’s upright, and nothing will fall out of it – now that is not something you see very often in luggage. Another huge benefit of the Rimowa Topas is that it is a zipperless suitcase. If you travel a lot, then you already know why this is so beneficial, (if not, then check out my post on zipperless luggage). Anyway, suitcases with latch closure system are more secure than those with zippers, as they cannot be easily forced open. The Topas is also equipped with 2 TSA approved combination locks. You choose the combination yourself, and the two locks really make the suitcase super-secure. And, TSA agents will still be able to open it up safely, if they need to perform a security check (so you won't find it broken when it arrives at the other end). If you frequently fly to the United States, this is a huge benefit. If the agents choose to inspect your luggage, they’ll open it any way they can, which is why you should always choose luggage with a TSA approved lock. With other locks, they have to forcefully open your suitcase, and that could damage it beyond repair. This is probably the biggest downside of the Topas, although it's not a big one: the telescopic handle can only be locked to one height setting, which is 30” above the ground. I personally prefer to have a handle that can be locked to several different settings, as I don’t always lock the handle to the same height. However, it's something you normally only find on very expensive cases, so I am not surprised they don't offer it. In terms of carry-handles, there is one on the top and one on the right side of the suitcase. There is also another really cool feature that I have to mention that helps you organize your luggage – the discreet add-a-bag holder. It’s on the front of the suitcase and it works like a charm. You simply pull out the belt, pull it through the handle of your other bag, and secure it back in place. Your bag will be secured to your suitcase and best of all; your hands will be free. And, it is certainly a much more convenient option than trying to secure your bag on the telescopic handle (I can’t be the only one who does that!). If you can afford it, then consider getting it. Overall, it is an amazing suitcase. Yes, it gets scuffed easily, but you will have that with any other aluminum suitcase. It’s the price you pay for such a lightweight shell. 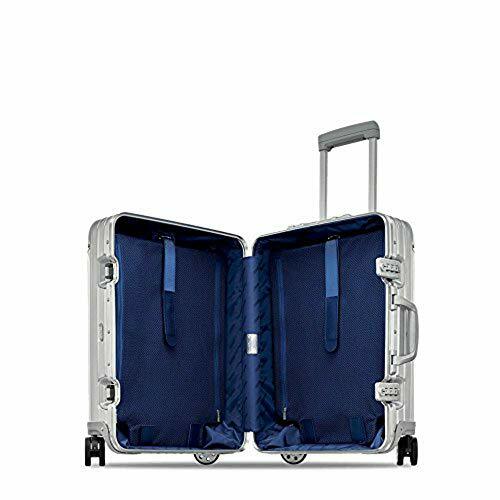 There are also many other cool features on this suitcase that justify its high price – the double spinner wheels, the double TSA lock, the 2 dividers and the add-a-bag holder. And, if you are worried about the durability of the Topas, the 5-year warranty might reassure you. 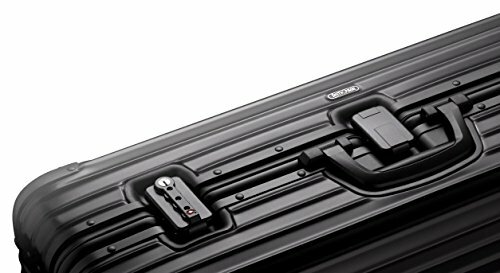 You shouldn’t buy this suitcase if it way out of your price range or if you don’t really travel that much. 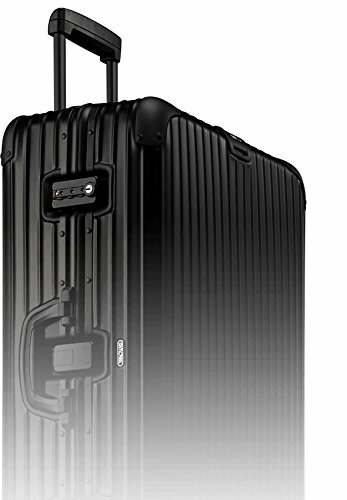 There are a lot of other, more affordable suitcases you can get, and I’ve reviewed a ton of them. Invest in this suitcase only if you are sure you will get your money’s worth, otherwise check out some other options. 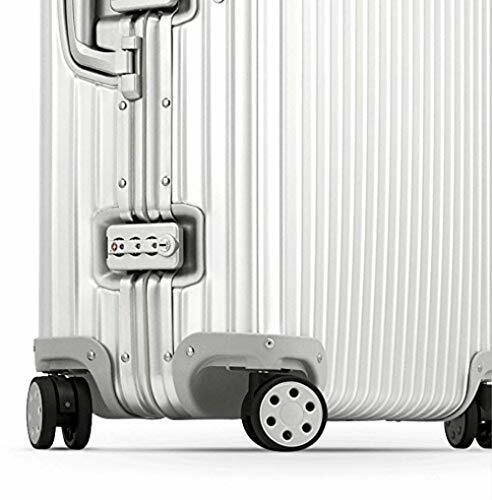 If you do want to invest in the Rimowa Topas, head on over to Amazon to get an excellent deal on this multiwheel carry-on suitcase!